When you go camping, you are also camping among wild animals who call the great outdoors their home. All over the United States it is not uncommon animals such as bears, moose, deer, skunk, squirrels, and raccoons, among many others. 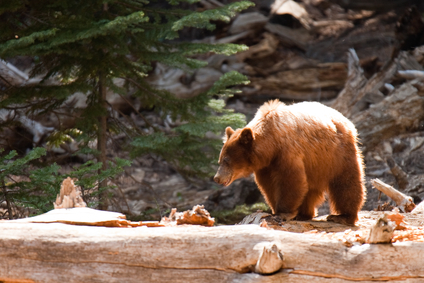 It is important for campers to respect wildlife as well as stay safe and protect yourselves and your property. There are many opportunities to camp in harmony with your animal neighbors – and here are a few tips how. First, no matter how cute or friendly they may seem – don’t touch the animals! Animals are very strong and have things like teeth and claws they could use to defend themselves. All animals have natural defense mechanisms to protect themselves while being threatened, and they could try those defenses on you if you get too close. This is definitely not a risk you want to take, who wants to be bit by an animal? Not to mention that animals carry diseases or parasites that could harm you if exposed. To add to this idea, make sure you don’t feed the animals! Although it seems like we are doing the animals a favor, we are actually hurting them more than helping them if you give them food. Animals have been looking for their own food their entire existence – don’t take that sense away from them! Animals can get used to getting fed, which is not a problem during camping season due to the abundance of campers. However, come winter, the animals lose their source of food and go hungry. Feeding animals also makes them more tame and less shy, which can cause problems as well. Finally, make sure you secure your food! If you forget a cooler outside the RV full of hotdogs, it is like an open invitation for a bear to come have a picnic! Even things like toothpaste, which smell like food, can attract animals. Keep all your food inside your RV and make sure you lock it up! No one likes uninvited guests, no matter how cute and fuzzy they are.